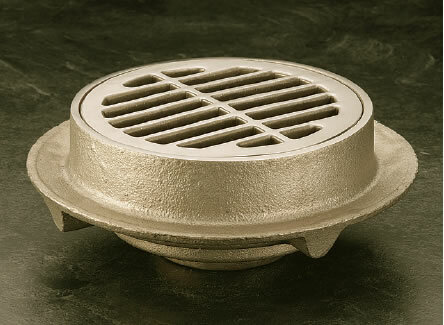 9710 & 9715 Medium Duty Top Floor Drain - Jay R. Smith MFG Co.
Used in floors where corrosive liquids must drain or be discharged. Solid top variation with closure plug allows placement of drains for future use. The advantage of stainless steel over high silicon iron is that it resists corrosive liquids, and accommodates machining for threaded outlets, secured top and/or flashing clamps. 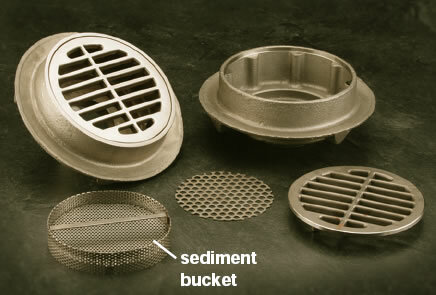 These drains are readily adaptable to most types of drain line piping materials. Type 304 stainless steel will handle a variety of corrosive wastes which are found in laboratories, chemical, atomic energy, photographic processing, dairy, breweries and bottling plants. CF8 (Equivalent to Type 304) Rough Finish Stainless Steel Body, and Loose Set Non-Tilt Grate. Smith 9710 CF8 rough finish stainless steel body with loose set non-tilt stainless steel grate for use in floors where corrosive liquids will be drained or dumped. Smith No. 9710 stainless steel drain with 8 1/2” diameter loose set non-tilt grate and flashing flange.